The village and beach of Olympiada from the ancient city of Stageira. gallery page 5. The site of the ancient city of Stageira, home town of the philosopher Aristotle, is 700 metres south of the seaside village of Olympiada, on the northeast coast of the Halkidiki pensinsula. 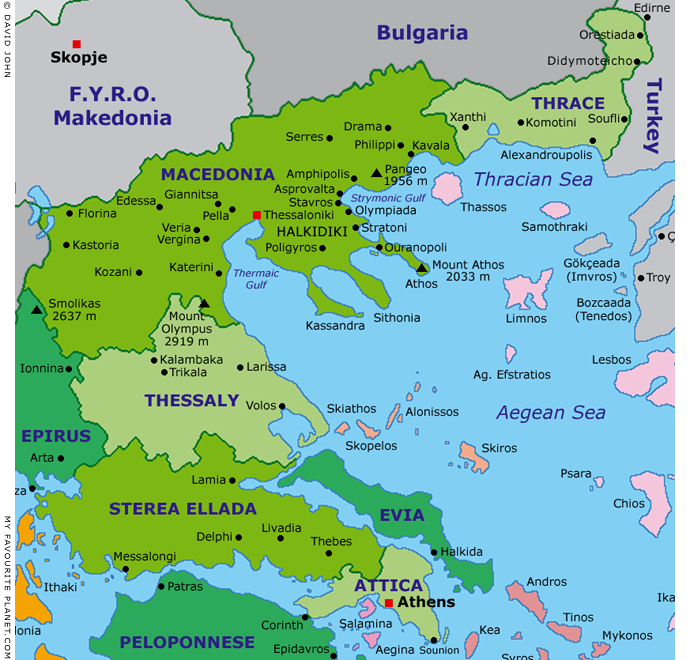 See the map of Macedonia below. Olympiada (Greek, Ολυμπιάδα; marked on some Greek maps as Olympias, Ολυμπιάς) is set in landscape typical of eastern Halkidiki, with its low, green hills, woods and rows of sandy bays. The village itself stands on a wide beach with clean, clear water. At the south side of the bay a fishing harbour is home to numerous small boats. The remains of Ancient Stageira occupy two hills on a small headland. Entrance to this archaeological site is free, and it provides the village with a wonderful public park with enchanting shaded paths leading between the ruins of fortications, houses and the market place (agora). The ruins themselves may not be spectacular, but the views over the Strymonic Gulf certainly are. On a clear day you can see across the gulf to the 1,956 metre high Mount Pangaeion (see photo below), famous for its gold and silver mines which once belonged to King Philip II of Macedon and his son Alexander the Great. Opening hours: daily 8.30 am - 9 pm. Entrance free. Don't go to the wrong Stageira! Ancient Stageira at Olympiada should not be confused with the modern village of Stageira, which is 25 km further south, and has no historical connection with Aristotle. Many travel guides confuse the two places, a confusion made worse by the fact that the modern Stageira has an "Aristotle Park" with a modern statue of the ancient philosopher similar to that in Olympiada. Modern Stageira, near Stratoniki and Stratoni, may be a nice place, but if you are travelling by bus and end up there, you may find it difficult to get from there to Olympiada. There is no bus connection between Stratoni and Olympiada. Olympiada is a relatively modern village, founded by Greek refugees from Agia Kyriaki, Turkey in the 1920s (see history part 7). It has developed into a low-key beach resort with two small hotels, rented rooms and apartments and a handful of restaurants, and has retained its relaxed, friendly village atmosphere. As with most resorts in Halkidiki it does not cater for mass-tourism. The majority of holiday-makers who visit here are people seeking a safe, quiet seaside retreat with attractive countryside and opportunites for day-trips around Macedonia. The area is particularly popular with families. Visitors come here from all over the world, particularly from central and eastern Europe, many to see Aristotle's birthplace. If you have your own transport, it is quite easy to visit other places around Halkidiki, such as Ouranopolis, Polygyros, Olynthos and the wild Holomontas mountain area just west of Olympiada. Also nearby in Macedonia are Thessaloniki, Pella, Veria and Vergina, Amphipolis, Kavala and Philippi. Public transport around Halkidiki is a bit trickier (see page 11: How to get to Stageira and Olympiada), with bus services around the peninsula centred at Thessaloniki. The place is simply beautiful and highly recommended. 1959 metre high Mount Pangaeion (Greek, Παγγαίο) visible across the Strymonic Gulf. 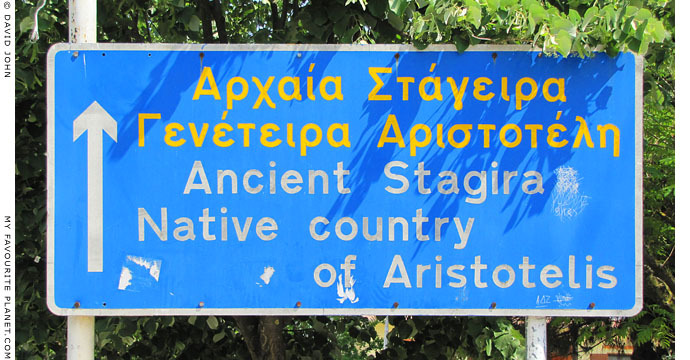 Olympiada road sign: "Ancient Stagira, native country of Aristotelis"
See the Ancient Stageira photo gallery with 38 pages of images and information.